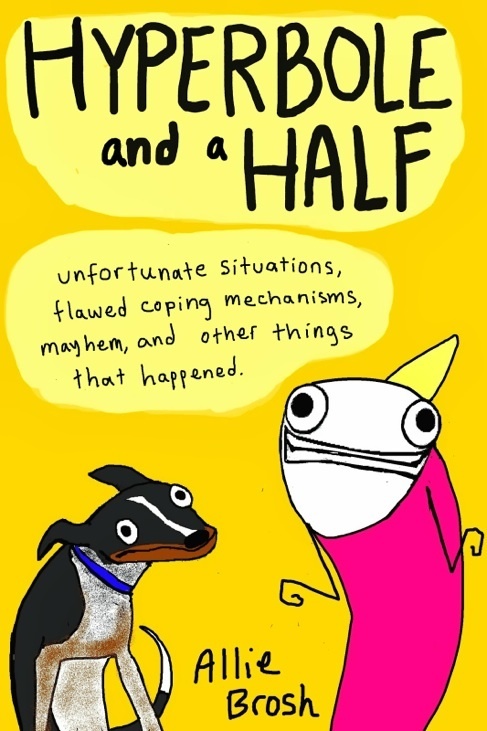 More than one friend of mine recommended Allie Brosh’s Hyperbole and a Half since she began the blog in 2009. These recommendations are usually followed by, “You have the same sense of humor.” For whatever reason, I’m turned off by that statement. I actively avoided reading anything Brosh wrote until recently. It was after I heard her interview with Terry Gross on NPR that I became intrigued. She was smart, funny and familiar with depression. That’s my kind of gal. I was a little too excited when a copy of the book Hyperbole and a Half was traded in at Bookmans. The bright yellow cover with a crude cartoon of Allie and a dog would have invited me to read it even if I had no prior knowledge of her and her writing. I planned to read a chapter or so once I got home, then put it back on my shelf for later. Instead, four hours and a skipped dinner later, I realized I had found my new favorite book. The pages are filled with a combination of hilariously bizarre cartoons and David Sedaris-esque story telling. Through her exaggerated illustrations and honest voice, Allie shares her hilarious childhood stories with the same sincerity and wit as she does with her chapters on struggling with depression. If anyone were to look over your shoulder and see the stick-figure drawings with warped faces and maniacal exclamation bubbles, they’d think you were reading mindless drivel. In her writing, however, you will find some of the most honest and articulate depictions of the human condition. Brosh is a genius. She writes about real situations and honest feelings that she experiences and not once did she come off as whiny or insincere. She makes readers laugh when they would otherwise cry and inspires us to not take ourselves so seriously. Never have I related to every single chapter of a book the way that I do with Hyperbole and a Half. I have never laughed so frequently. Every single page had me laughing out loud. I’ve also never read a better depiction of depression. Without plunging into self-indulgence, Allie shares her battle with us in a way that makes me, and I assume other readers, think excitedly, “FINALLY SOMEONE GETS IT!” She takes readers on a roller-coaster of familiar emotions, but keeps us laughing the entire time. I devoured the book in one sitting and admit that I wanted to cry over it not being long enough to read forever. I urge everyone to read it. Be prepared to have so much more fun than you imagined you could when reading a book. My second piece of advice? Don’t read it in public-unless you don’t mind being that person sitting alone at a coffee shop laughing hysterically with pieces of scone falling out of your mouth. I know that the 384 pages aren’t enough, but that’s okay because Brosh still has her blog that is filled with dozens of other equally hilarious stories and illustrations to keep you satisfied until she comes out with another book (fingers crossed). Not sure where to find a copy of Hyperbole and a Half? Give your local Bookmans a call to request a shelf check. Harry Potter, Thank You for All the Years of Magic!